Stem cells contribute to the body’s ability to renew and repair its tissues. Unlike mature cells, which are permanently committed to their fate, stem cells can both renew themselves and create new cells of whatever tissue they belong to (and other tissues). Stem Cells are unspecialized (undifferentiated) cells that are characteristically of the same family type (lineage). They retain the ability to divide throughout life and give rise to cells that can become highly specialized and take the place of cells that die or are lost. What is the connection between Stem Cells and Platelet Rich Plasma? PRP contains a high concentration of stem cells. These stem cells are able to replenish themselves and have the unique ability to differentiate and become specialized cells i.e. (skin cells with a specific functions). PRP is plasma with many more platelets than what is typically found in blood. The concentration of platelets and, thereby, the concentration of growth factors can be 5 to 10 times greater (or richer) than usual. PRP contains stems cells that tell the body to produce more stem cells to go to the area they are needed. Platelet rich plasma is obtained by drawing one small vial of blood, which is then placed into a table top centrifuge and spun at a high rate to separate platelets from other blood components. This PRP (clear to slightly yellow in tint) is a direct extract of your own blood and therefore devoid of any risk of adverse or allergic reactions. Stem cell therapy appears to restart the process of growth and healing to some organs. Once introduced back into the injured site, the platelets then release more growth factors and signalling proteins that basically tell the body to send in the stem cells and create the healing process. The stem cells by themselves are not capable of repairing the area, they need to be directed, and the platelets are considered to be the directors in this cellular process. With PRP, your stem cells will then have a directed response to the site of injury and be able to repair damaged structures. How do Stem Cells in PRP work and what can it be used for? • PRP can be used for skin rejuvenation. The PRP, injected into specific areas of the skin acts as a matrix that promotes your own collagen to grow, regenerates tissues and thus act as to soften wrinkles and creating smoother skin texture and tone. PRP is also used for voluminizing faces that are beginning to look drawn, to plumb out cheeks indentations, soften under eye hollows as well as improve skin tone. • PRP is used together with rolling to treat stretch marks. This involves using a roller with dozens of tiny needles. The dermaroller is rolled over numbed skin and tiny needles, which are up to 2mm long, penetrate the epidermis. These microscopic puncture sites stimulate your body’s own collagen and elastin production, resulting in Improvement in skin texture, tone, and uniformity of colour. This causes a controlled injury which increases blood flow and forces the body to produce collagen and this tightens up the skin. 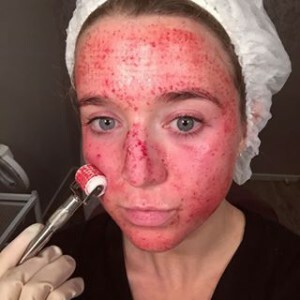 Following micro needling, platelet rich plasma is applied to the skin surface and penetrates the multiple fine perforations created by the procedure, initiating a localized stem cell response and recruiting collagen-producing cells known as fibroblasts. The fibroblasts then replace tissue that has been damaged or lost due to the aging process with healthy skin that looks refreshed and rejuvenated. • PRP can also be used for hair loss, with a thin needle, your own Platelet-Rich Plasma (PRP) is injected into the scalp. Then the growth factors in your blood cells do their job and hair growth is naturally stimulated. What happens during a PRP consultation & treatment? • Your practitioner will discuss any potential problems connected with the treatment based on your medical history. • The practitioner should take a medical history to make sure that there are no reasons why you shouldn’t have the treatment. Then you will usually be asked to read detailed information and sign a consent form which means that you have understood what the treatment may do, along with any potential side effects. • 10 to 20 minutes before your procedure, your practitioner will draw 10-20ml of blood. This is done in a similar way to when you have blood taken for testing at the doctor’s office. • The blood will then be spun in a centrifuge to separate the platelet plasma from the red blood cells. • Any makeup on the skin will be removed using a wipe, and antiseptic will be applied to the injection site. Depending on your practitioner, a topical local anaesthetic will then be applied to the skin of the injection site. The PRP will then be injected into the skin in the desired area using a very fine needle. Injections will be given multiple times in multiple locations in order to give an overall improvement to the area. • An ice pack may then be pressed onto the treated site to reduce any swelling. You will then be free to leave and go about your daily business. The whole procedure usually takes about 30 minutes. • It may take a few weeks for the results of the PRP therapy to become visible, but with two to three top-up treatments, you can expect the results of PRP therapy to last for up to one and a half years. There are few side effects associated with Platelet Rich Plasma Therapy. Immediately after the procedure, you can expect some bruising, swelling and redness at the injection sites. You may also experience some tenderness and pain at the injection sites. However, any side effects should dissipate within a few days following the procedure. Some patients will be able to go straight back to their normal regime following treatment, but if you experience any tenderness or pain at the treatment site, you should take extra care when washing and caring for your skin in the days following the PRP therapy. To undergo PRP therapy, you should be in general good health and you should have realistic expectations of the outcome. Most people are suitable candidates for PRP therapy, and it is recommended as a safe treatment for individuals who are do not want to undergo more invasive procedures. People with platelet dysfunction syndrome, critical thrombocytopenia, hyperfibrinogenaemia, haemodynamic instability, sepsis, acute & chronic infections and chronic liver pathology are not suitable candidates for PRP therapy. Only fully trained and qualified medical practitioners (nurses, aesthetic therapist, doctors or cosmetic surgeons) should perform PRP therapy.